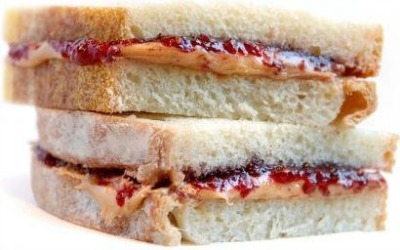 Peanut and Jelly Sandwich is probably the number one choice for a sandwich with American children as well as adults! I know that I still enjoy this sandwich as an adult. These delicious sandwiches are considered staples in Americans’ kitchens and are the best-loved sandwiches by children and adults alike! Photo from Boston Globe newspaper. 1880 – A St. Louis physician, Dr. Ambrose W. Straub, crushed peanuts into a paste for his geriatric patients with bad teeth. At the 1893 Chicago World’s Fair, known as the World’s Columbian Exposition, it gained exposure and popularity. 1903 – On February 14, 1903, Straub received Patent No. 721,651 for a “mill for grinding peanuts for butter.” Dr. Straub encouraged the owner of a food products company, George A Bayle Jr., to process and package ground peanut paste as a nutritious protein substitute for people with poor teeth who couldn’t chew meat. Bayle Food Products of St. Louis purchased all commercial rights to the physician’s peanut spread and went on to become peanut butter’s first American vendor. 1904 – Bayle food Products took its new peanut butter to the St. Louis World Fair. It was a big success and gained exposure and popularity after it sold out in three days at a penny a sample, earning a profit of $705.11. Soon grocers across America were selling bulk peanut butter in large wooden tubs to satisfy their customers’ demands. Ye Olde English Coffee House made a “Peanut Butter and Pimento Sandwich. The Vanity Fair Tea-Room served its peanut butter with watercress. The Colonia Tea-Room served peanut butter on toast triangles and soda crackers. For variety, some day try making little sandwiches, or bread fingers, of three very thin layers of bread and two of filling, one of peanut paste, whatever brand you prefer, and currant or crab-apple jelly for the other. The combination is delicious, and, so far as I know, original. 1920s to 1930s – Commercial brands of ultra-creamy peanut butter such as Peter Pan and Skippy were introduced. 1941 to 1945 – Both peanut butter and jelly were on the U.S. Military ration menus in World War II (1941-1945). It is said that the American soldiers added jelly to their peanut butter to make it more palatable. Peanut butter provided an inexpensive and high protein alternative to meat for soldiers. It was an instant hit and returning servicemen made peanut butter and jelly sales soar in the United States. Soldiers in World War II used to call peanut butter “monkey butter.” Food historians have not found any ads or other mentions of peanut butter and jelly sandwiches before the 1940s. 1943 – Nationwide food rationing was instituted in the United States during World War II. Each member of the family was issued ration books, and it was the challenge of the homemaker to pool the stamps and plan the family’s meals within the set limits. Margarine, butter, sugar, lard, shortening, oils and assorted fresh meats were rationed and expensive. Peanut butter was a good cheap (peanut butter sold for 24 cents a jar) alternative and a readily available source of protein. Peanut butter was not rationed. Did you know? – April 2nd has been named an unofficial National Peanut Butter and Jelly Day. I hope you can help to correct the misinformation you/others have put into print regarding the “origin” of peanut butter and jelly sandwiches. As the youngest of three children raised during the Great Depression in Berkeley, California, I can tell you with certainty that we ate pb&j a lot. Our mother was very frugal, she had to be. She baked bread from scratch many days a week, and I can remember, at age 5, delivering warm loaves fresh from the oven to neighbors who paid 5 cents a loaf. Mother made a little cash with these sales and peanut butter was a staple purchase – the jam she made from scratch using fruits she could grow or buy from the “over ripe box” at the market. We were not the only kids to have pb&j in our lunch boxes. It was hardly the kind of thing that you would write in a “cookbook.” I think the lack of a printed record describing how to spread peanut butter and jam on a piece of bread does not mean that it did not happen – it did. Do you have a written record of when the first “toast” was served? Was it buttered? What kind of butter? Some things just happen naturally and often in many wide spread areas. There is no doubt that the GIs mixed their peanut butter with jelly or jam whenever possible – butter in those days separated easily and really stuck to the roof of your mouth. The fruit – whatever it was, eased that problem and besides it tasted good. Do you have any record of serving peanut butter and mayonnaise on saltines? V ery popular in Georgia in the early 1930’s. Didn’t spread too far even with the war.